When it comes to one pot meals like these cauliflower rice bowls, I like to keep things as simple as possible. Time and time again I always come back to my favorite flavor combination of mushrooms and sausage. There’s something so comforting yet basic with these two ingredients and I can’t get enough. I also love how economical this meal is. There’s nothing fancy going on, just honest ingredients that all compliment each other to create a bowl licking, no crumbs left kind of meal. If you haven’t made cauliflower rice before don’t fret! It’s simple and is a great way to incorporate more veg in your dinner plans. I’ve even heard of some grocery stores selling pre “riced” cauliflower but I do encourage you to first try and find local cauliflower from your farmers market first and “rice” it yourself. It’s so easy and saves on packaging and you can feel good that you’re supporting local farmers first. With that being said, if there’s no local cauliflower in sight do what you need to do! 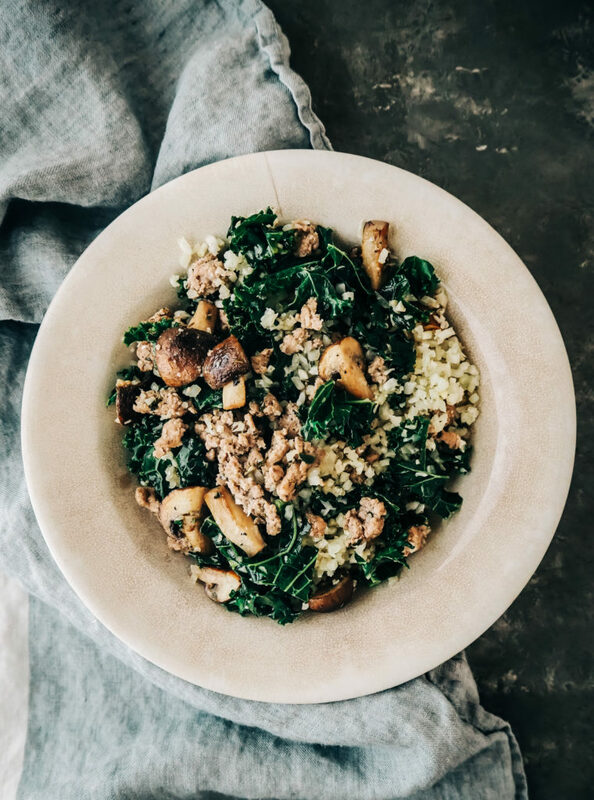 This meal is such a breeze to prepare and is chock full of hearty ingredients like pastured raise pork, locally grown mushrooms, and fresh kale that’s still cranking from the farm. We’re definitely making a dent in our chest freezer from all the pork from our pigs last season and it’s getting me excited for this year’s pigs to arrive in the spring. And while veggies will always be my first love at the farm, it’s been really fun raising pigs these past few years. They add such a great dynamic to the farm and are the best compost eaters ever! Anyhow, I hope you all enjoy these mushroom & sausage cauliflower rice bowls as much as we do. Place the cauliflower florets in the bowl of a food processor and pulse until the mixture resembles a coarse "rice-like" consistency. Stop and scrape down the sides as needed. Be careful not to over mix the cauliflower or you'll end up with more of a "mash." Set the riced cauliflower aside. Heat a large skillet over medium-high heat and add the pork sausage. Use a wooden spoon to break up the meat a bit and cook, stirring often until no longer pink in the middle. Use a slotted spoon to remove the pork from the pan and place the pork on a paper towel lined plate to drain. In the same pan add a little cooking fat of choice (we used bacon) and stir in the crushed red pepper flakes and thyme. Add the onion, garlic and mushrooms and cook, stirring occasionally until the veggies are tender, about 8 minutes. Add the wine, stir the mixture and cook until most of the liquid has evaporated. Stir in the chopped kale and use tongs to mix the kale in evenly. Cook until the kale wilts a bit and turns bright green. Add the riced cauliflower, reserved sausage, grated cheese and a hefty pinch of salt and pepper. Cook for about 5 minutes longer or until cheese melts and cauliflower is warmed through. Divide the mixture between bowls and serve warm. Andrea, at what point do you like to add back in the cooked sausage? Thanks for the catch. I just updated the recipe. But you add the pork back when you stir in the cauliflower. I hope you enjoy this dish as much as we do! Yum! This looks amazing Andrea. I’ve stopped making cauliflower rice because I was getting a bit tired of it – but this is inspiring me to revisit it! (and I have a cauli in the fridge) Yay! I made this over the weekend with ground turkey (that’s what we had on hand), added fennel and coriander seeds during the cooking process and divided it into containers for lunches this week. It was delicious! This was delicious – excellent flavors! Thank you for sharing! This looks yummy! I have done something similar with a package of andouille sausage, a package of spicy chicken-mango sauage, tri colored peppers, tomatos, and cauliflower. We are adding shrimp to it next time. Thanks for the new option!